Abreu moments from launching a homer to center. I was on hand last night at Guaranteed Rate Field for Battle of the First Round Draft Pick. The White Sox and the San Fransisco Giants own the third- and second-worst records in baseball, both peering with mixed feelings at the cellar position and dubious compensation. Although Sox General Manager Rick Hahn has thus far done a terrific, and to many surprising, job of restocking the franchise's depleted farm system through trades, the team can use all the help it can get. The Sox didn't help out themselves last night, crushing the Giants 13 to 1 behind an improbably sterling performance from beleaguered starter David Shields, who held the Giants to one hit through six and a third innings before surrendering a homer to Nick Hundly. Shields made the Giants hitters look foolish and over-matched all night, hitter after baffled hitter trudging back to the dugout hanging his head ("muscle memory," my buddy Dan quipped.) The Sox bats were hopped up on a cool, windy evening, all six of the home runs no-doubters. I hadn't heard such loud contact the park in a long, long time. By the far the highlight of the game was Jose Abreu hitting for the cycle, only the sixth White Sox player to do so (the last was Jose Valentin, in April 2000). Coming to bat in the eighth, Abreu had already slugged a homer to deep center, driven a double down the left field line, and looped a little single into shallow left. What was ridiculously fun and improbable about the cycle was how steeply the odds were stacked against Abreu: a triple his hard to will; Abreu's a big guy, the opposite of swift; he fouled the second pitch, a 94 mile per hour fastball, off his foot, a real stinger that brought out manager Rick Renteria and team trainer Herm Schneider. All Abreu did was laser the very next pitch, another fastball, to the gap in right-center. As he rounded second I, and thousands of others, yelled "He's gonna go for it! "—he slid into third just ahead of the throw. I've never seen a player hit for the cycle, and to see one of my favorites do it—improbably!—at his home park was a thrill I won't soon forget. 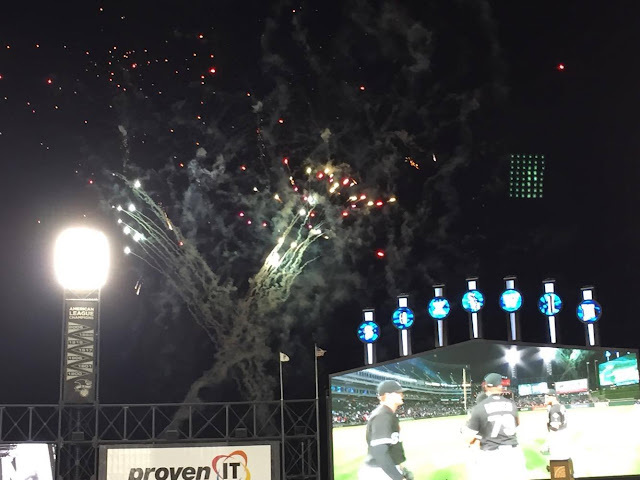 The White Sox scoreboard operator seemed a bit overwhelmed by all of the clangorous contact throughout the night—the Sox rapped out eighteen hits—and didn't acknowledge Abreu's feat, only flashing on the big screen a GIF of an applauding baseball. Just as well. Abreu's a modest, go-to-work guy. He smiled and caught his breath while standing on third, and received the mauling of congratulations in the dugout, a celebration I was fortunate to be able to see form my seat just above the visitors' dugout. 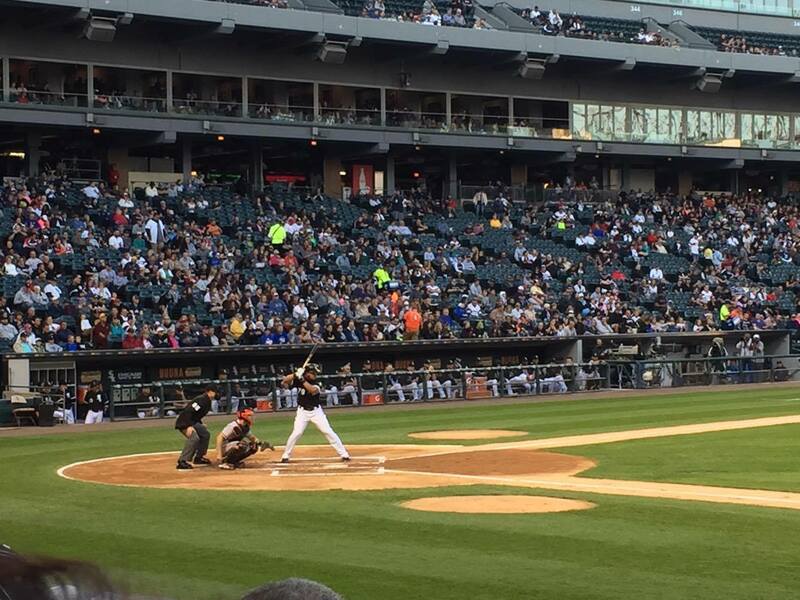 Another night at the park for the low-key and gifted Abreu, only this time it was historic. It was Tim Raines Night last night. Dan and I were somewhere between the Craft Kave and our seats when Raines threw out the first pitch, but we were each clutching out Raines figurine, courtesy of the team. The scoreboard ran a terrific career-spanning video montage of Raines running, hitting, cashing into walls, and mugging it up in various dugouts. 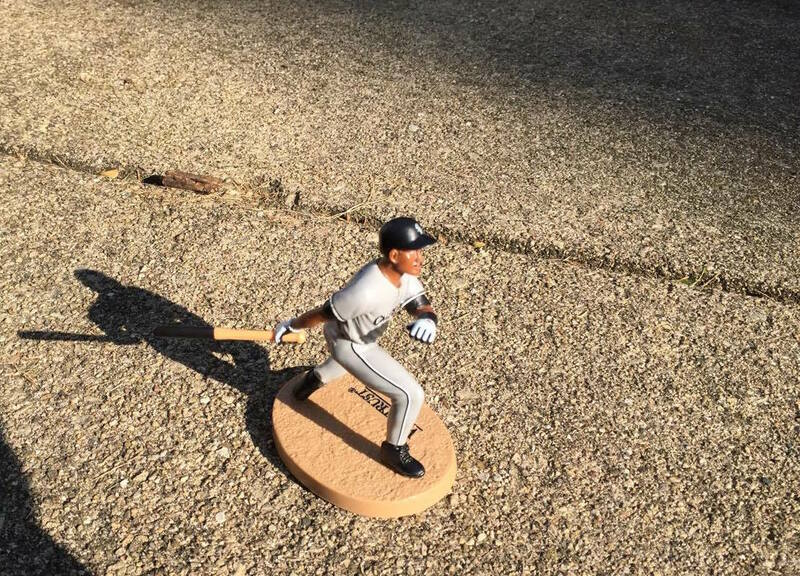 Truth be told, "The Rock" excelled during an era when I wasn't paying much attention to baseball; distracted, I didn't find my way back from my late-70s/early-80s love affair with the game until roughly the mid-90s, when Raines left the White Sox for the Yankees. I'd missed him, but I love the fact that's he's heading to Hall, and that the team for which he played five of his twenty three seasons would so fete him. A fun night all around.